Popcorn balls are fun to eat but can be tricky to shape when working with hot sugar syrup. So keep it simple and make this popcorn snack mix! Yummy butter, brown sugar and apricot jam masquerade for the typical corn syrup in popcorn balls. Toasted almonds and dried apricots sneak in an extra flavor surprise. 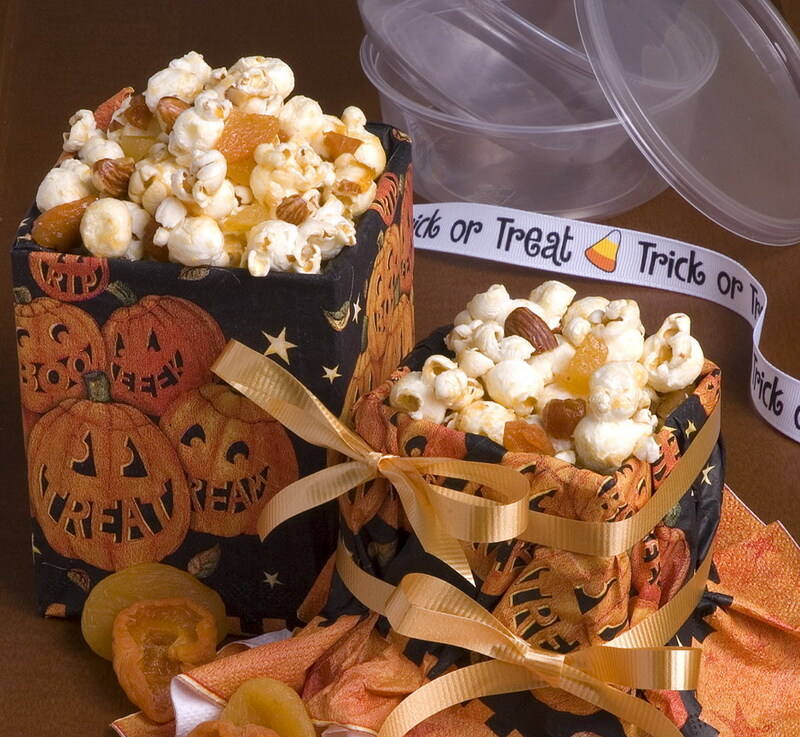 For crafty dishware use halloween napkins or fabric to cover small milk cartons or empty food containers. Kids can wrap the containers then tie or glue in place – it’ll keep those ghouls and boys busy while awaiting trick-or-treat time! MIX popcorn, apricots and almonds in a large bowl. DRIZZLE sugar syrup over popcorn and fruit mixture, stirring quickly until evenly coated and cool. Serve the same day to retain crispness, or place in a sealed plastic bag for up to 1 day. NOTE: Adult supervision should be provided if children are working with hot sugar syrup. Recipe from Sun-Maid Growers. Photo by Kelly Burgoyne. I love, love, love this Rosemary!!!!! This is absolutely a perfect snack for Halloween. I love dried apricots, and am always looking for ways to use them once the fresh apricot season is done. I can’t wait to make this! Love this idea, Rosie. Reminds me of your popcorn balls from a few years back. I never would have thought of adding dried fruit to a popcorm mix! That was a Sun-Maid recipe too, but this is so much easier!